WASHINGTON -- Upon arrival at the Pentagon in Washington, South Korean Defense Minister Jeong Kyeong-doo received a warm welcome from his US counterpart, James Mattis, ahead of their annual talks over a crucial security agenda. 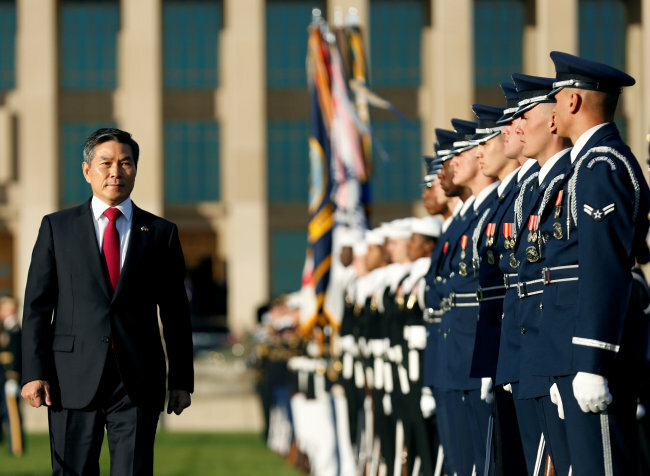 The US Department of Defense held a full honor guard ceremony involving the Army, Navy, Air Force, Marine Corps and Coast Guard -- a rare event that US and South Korean officials said highlighted the level of importance Washington attaches to its longtime Asian ally. On the parade field in front of the complex, Jeong moved past the honor guards for a ceremonial inspection, which was followed by a 19-gun salute and the playing of South Korean and US national anthems. Such a full-scale event has rarely been held. Previously, the Pentagon held a small-scale ceremony just at the entrance of its complex, officials said. It is the third such event that Mattis has hosted since he took office in January last year, a Pentagon official explained. The welcoming event proceeded ahead of the Security Consultative Meeting that marked its 50th anniversary. The SCM has been the allies' overarching defense consultation dialogue held alternately in their respective capitals every year.